This article is about the technical field of electronics. For personal/home-use electronic devices, see consumer electronics. For the scientific magazine, see Electronics (magazine). The nonlinear behaviour of active components and their ability to control electron flows makes amplification of weak signals possible. Electronics is widely used in information processing, telecommunication, and signal processing. The ability of electronic devices to act as switches makes digital information-processing possible. 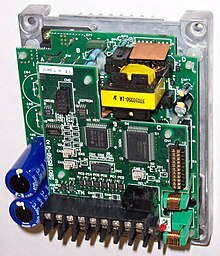 Interconnection technologies such as circuit boards, electronics packaging technology, and other varied forms of communication infrastructure complete circuit functionality and transform the mixed electronic components into a regular working system, called an electronic system; examples are computers or control systems. An electronic system may be a component of another engineered system or a standalone device. As of 2018[update] most electronic devices use semiconductor components to perform electron control. The study of semiconductor devices and related technology is considered a branch of solid-state physics, whereas the design and construction of electronic circuits to solve practical problems come under electronics engineering. This article focuses on engineering aspects of electronics. Vacuum tubes (Thermionic valves) were among the earliest electronic components. They were almost solely responsible for the electronics revolution of the first half of the twentieth century. They allowed for vastly more complicated systems and gave us radio, television, phonographs, radar, long-distance telephony and much more. They played a leading role in the field of microwave and high power transmission as well as television receivers until the middle of the 1980s. Since that time, solid-state devices have all but completely taken over. Vacuum tubes are still used in some specialist applications such as high power RF amplifiers, cathode ray tubes, specialist audio equipment, guitar amplifiers and some microwave devices. Sometimes it may be difficult to differentiate between analog and digital circuits as they have elements of both linear and non-linear operation. An example is the comparator which takes in a continuous range of voltage but only outputs one of two levels as in a digital circuit. Similarly, an overdriven transistor amplifier can take on the characteristics of a controlled switch having essentially two levels of output. In fact, many digital circuits are actually implemented as variations of analog circuits similar to this example – after all, all aspects of the real physical world are essentially analog, so digital effects are only realized by constraining analog behavior. Many different methods of connecting components have been used over the years. For instance, early electronics often used point to point wiring with components attached to wooden breadboards to construct circuits. Cordwood construction and wire wrap were other methods used. Most modern day electronics now use printed circuit boards made of materials such as FR4, or the cheaper (and less hard-wearing) Synthetic Resin Bonded Paper (SRBP, also known as Paxoline/Paxolin (trade marks) and FR2) – characterised by its brown colour. Health and environmental concerns associated with electronics assembly have gained increased attention in recent years, especially for products destined to the European Union, with its Restriction of Hazardous Substances Directive (RoHS) and Waste Electrical and Electronic Equipment Directive (WEEE), which went into force in July 2006. 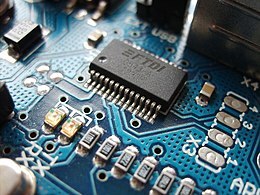 Electronic systems design deals with the multi-disciplinary design issues of complex electronic devices and systems, such as mobile phones and computers. The subject covers a broad spectrum, from the design and development of an electronic system (new product development) to assuring its proper function, service life and disposal. Electronic systems design is therefore the process of defining and developing complex electronic devices to satisfy specified requirements of the user. ^ "electronics | Devices, Facts, & History". Encyclopedia Britannica. Retrieved 2018-09-19. ^ "October 1897: The Discovery of the Electron". Retrieved 2018-09-19. ^ Floyd, Thomas L. Electronics fundamentals : circuits, devices, and applications. ISBN 978-1-292-23880-7. OCLC 1016966297. ^ Power Electronics and Variable Frequency Drives: Technology and Applications. Wiley Online Library. 1996. doi:10.1002/9780470547113. ISBN 978-0-470-54711-3. ^ Pugh, Emerson W.; Johnson, Lyle R.; Palmer, John H. (1991). IBM's 360 and early 370 systems. MIT Press. p. 34. ISBN 978-0-262-16123-7. ^ J. Lienig; H. Bruemmer (2017). Fundamentals of Electronic Systems Design. Springer International Publishing. p. 1. doi:10.1007/978-3-319-55840-0. ISBN 978-3-319-55839-4.